The arcade classic finally comes home! 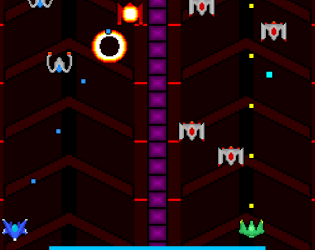 Pilot two ships at once as you take on thousands of enemies. Arcade mode has you traveling across eight unique stages, each with their own boss. You can also test your skills in the never ending high-score mode. CONTROLS: A and S to move the blue ship, and Mouse to move the green one. You can also change to "keyboard only" mode on the title screen to control the green ship with arrow keys.